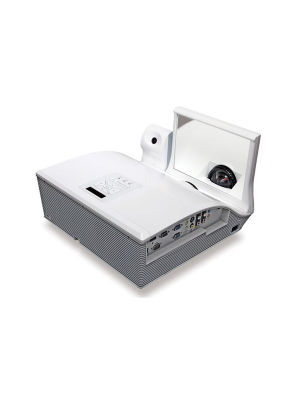 The MimioProjector 280I interactive ultra-short throw projector packs the best of the features of its predecessors. Ultra-short throw, interactive as well as easy connectivity options, the 280I makes it an ideal substitute for the existing projectors. 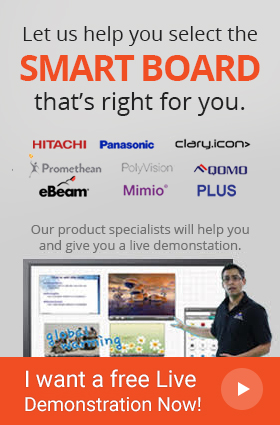 It can easily be integrated with similar Mimio products such as the MimioBoard and MimioTeach and further enhances collaborative leaning through the MimioStudio. The MimioProjector 280I features a 16:10 aspect ratio with 3100 lumens of brightness and brilliant colour with 1.07 billon colours. Using a digital light processing technology for image projection with adjustable controls, the 280I ultra-short throw delivers an immaculate display. In addition to this, the 280I features a lamp based high resolution projection that guarantees a 3000 hours stay on time in normal mode and 4000 hours lamp life on eco mode. Furthermore, it features numerous input and output ports such as the HDMI, VGA, S-video, and audio in and out and composite analog ports that allow easy connectivity with external media and computers. The 280I allows interactivity with the projected image through the interactive stylus and can feature up to 10 pens simultaneously on the Windows OS. With built in stereo systems, and direct one to one interaction with the projected image, Mimio 280I engages students in an intuitive learning environment making it fun-filled and attractive.